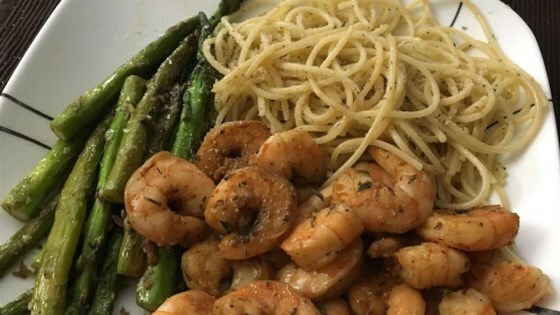 "Shrimp seasoned with paprika, thyme, oregano, garlic, and red pepper." Combine paprika, thyme, oregano, garlic powder, salt, pepper, and cayenne pepper in a sealable plastic bag; shake to mix. Add shrimp and shake to coat. Heat oil in a large non-stick skillet over medium high heat. Cook and stir shrimp in hot oil until they are bright pink on the outside and the meat is no longer transparent in the center, about 4 minutes. This recipe was okay but I am not likely to make again. This was really good! My husband said it was the BEST shrimp dish he'd ever had! Score. Thanks for the recipe. This will go into my recipe box!! Very quick and easy. Just the right amount of spice. Served with cheddar biscuits and the family enjoyed it thanks!! Very good and so easy to adjust to your family's tastes. Paired with Garlic Rice from this site and was perfect with it. It is amazingly delicious and so simple. I added 2/4 teaspoons of Creole seasoning which made it spicier. It was awesome without being overwhelmingly spicier. So simple and the seasoning mix is excellent. Will make it again soon. Hubby loved it too.